Ed Tech/Web 2.0 Tools for Educators and Students: Google Mail Email alerts. So many of those who used to but no longer use Microsoft Outlook for their email, remember the ability to get notifications when you have something on your calendar or a new email. In our district we have gone to using Google Apps for Education and the question of "how to get notifications" has come up. This blog entry will discuss this ability. First off you must use Google Chrome to get your desktop notifications to work. If you need to see how to install and learn some tips and tricks for Google Chrome then just click on one of the Google Chrome links. 2. Log into your google apps domain and then navigate to your email. 3. In email click on one of the gear icons found in the top right corner of your screen. 4. Choose the "Mail Settings" option. 5. Scroll down a little until you come to the section that says "Desktop Notification." Choose whether you want both chat and new mail notifications to be on. 6. Scroll down to the bottom and click "Save Changes." 7. You will now see a little popup when you get email or a chat message. Now if you want to set up reminders for appointments in your calendar follow these steps. 1. Again make sure you are using Google Chrome. 2. 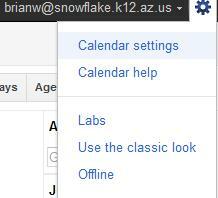 Navigate to your Google Calendar. 3. Click on the "Gear" icon found in the top right corner of your screen. 4. Choos the "Calendar settings" option. 5. Scroll down a bit until you find the section that says, "Gentler reminders (labs)." Choose the options that fit your needs. 6. Click the "Save" button when you at the bottom of the page. 7. Now when you have an event reminder in your calendar, you will get a popup that reminds you.